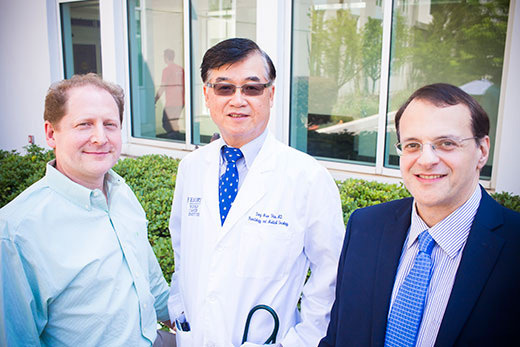 Emory investigators for "Molecular Characterization and Treatment of Head and Neck Squamous Cell Carcinoma Patients with Diverse Ethnic Background" include (left to right) Michael Rossi, assistant professor of radiation oncology; Dong Moon Shin, professor of hematology and medical oncology; and Nabil Saba, professor of hematology and medical oncology. Not pictured are Georgia Chen, professor of hematology and medical oncology, and Aminur M. Rahman, research associate. The Global Research Cooperation Funding (GRCF) provides funding to support initiatives in internationalization. Applicants from any discipline are encouraged to submit funding applications for innovative and sustainable programs built around collaborative research and/or learning and teaching initiatives linking Yonsei University and Emory University. • Read the call for proposals. • Read the guidelines for applicants. • Download the application for GRCF funding. With the recent development of targeted therapies for cancer treatment relying in part on genomics, understanding how ethnic differences play out at the molecular level has now become critical to offering effective care across populations in precision oncology. Dong Moon Shin, professor of hematology and medical oncology in Emory School of Medicine and Frances Kelly Blomeyer Distinguished Chair in Cancer Research at Winship Cancer Institute, a renowned expert in head and neck cancers, is leading the U.S. half of an international team of researchers dedicated to understanding this relationship in order to improve cancer treatment. This effort is funded in part by a collaborative agreement between Emory University and Yonsei University in Seoul, South Korea, as part of Emory’s Korea Initiative. Shin’s co-principal investigator on the project is Soonmyung Paik, professor in the Severance Biomedical Science Institute and Department of Medical Oncology at Yonsei University School of Medicine. Emory and Yonsei have been exchanging faculty and students and collaborating on research since 1990. Both universities are committed to deepening these longstanding ties, with a focus on cultivating long-term faculty relationships. The partnership was formalized in 2015 after Emory named South Korea a geographic focal point in its global strategies. As of the 2016 Open Doors Report, Emory was home to almost 500 Korean students and scholars. There is also a thriving alumni chapter in Seoul. The Office of Global Strategy and Initiatives (GSI) functions as an incubator for projects that increase Emory’s global impact. GSI forges connections abroad, identifies and cultivates strategic partners, and creates the conditions for Emory’s success, as has occurred with Yonsei. The GRCF is administered through the Halle Institute for Global Learning, the department within GSI that spearheads the academic arm of Emory’s country initiatives. Two projects have already gotten their start supported by GRCF. A symposium centered on the aforementioned collaboration is scheduled for October 2017 at Yonsei University. Four investigators from Emory, including Shin, will attend and speak. The second project funded is a collaboration between Emory’s Young-sup Yoon, professor of medicine and biomedical engineering, and Yonsei’s Seung-Woo Cho, associate professor of biotechnology, both stem cell experts. Stem cells are undifferentiated cells that have been touted for their potential use in regenerative medicine and bioengineering. However, cost-ineffectiveness and a tendency to form tumors make them less than ideal. Yoon, Cho and their teams are investigating directly reprogramming more common somatic cells into neurons, cardiomyocytes and endothelial cells to the same purpose. Their long-term, cross-disciplinary collaboration includes developing and offering laboratory courses in methods, as well as multiple research projects and opportunities for exchange. The international offices at Emory and Yonsei are currently accepting applications for the 2017-2018 GRCF awards. Eligible collaborative projects may include distance education and teaching proposals as well as research. Interdisciplinary projects are strongly encouraged.